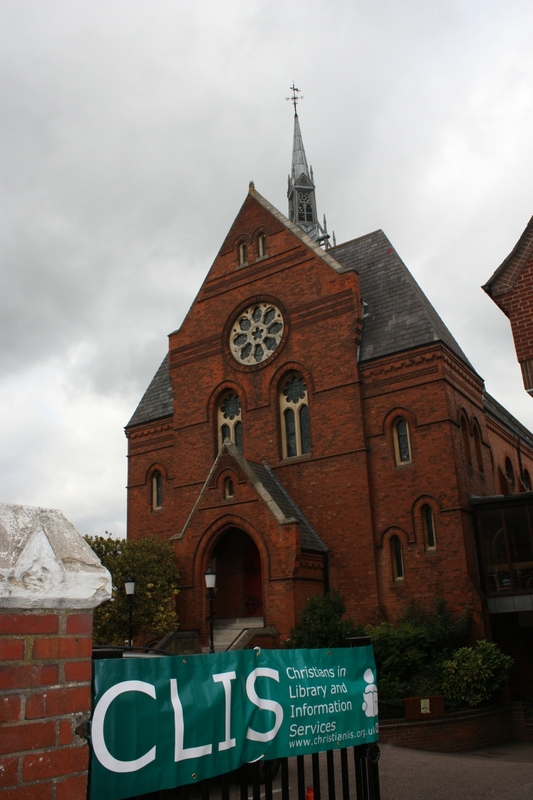 CLIS President Eddie Olliffe welcomed members and friends to Dagnall Street Baptist Church in St Albans for the CLIS Annual Lecture, which was given by Rev. Simon Carver, Senior Minister at the Church and a regular contributor to Premier Christian Radio, specialising in film reviews. 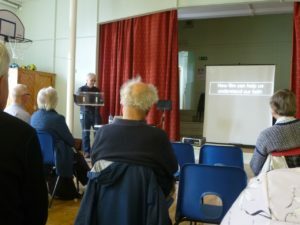 Simon is fascinated by films in general, not just those with a Christian theme, and his talk was illustrated with lots of clips from some of the most popular films of the last twenty or so years, plus a few from the earlier years of the film industry. Are films and faith compatible? Is the film industry sympathetic to the Christian faith? Simon would argue that as Christian values can sell films, then Hollywood is happy to use them. He instanced Mel Gibson’s The Passion of the Christ, which sits in the top hundred most successful films of all time. Pureflix (modelled on Netflix) produces films for the Christian market, partly to act as a bulwark against the values of the secular world. But Holywood is not at war with Christianity; there are few openly atheist films – they don’t sell well, as film-makers in the US don’t want to alienate a large section of the film-watching public. The Greatest Story Ever Told is probably the best of the early Biblical films, telling the story of Jesus. More recent re-tellings of Biblical episodes are less obviously ‘preachy’ and delve much more deeply into the psychology of the characters. Simon believes that a film-maker doesn’t have to be a Christian to give a Christian slant to a film; similarly, a film doesn’t have to have a Christian theme to say something relevant to Christianity. Turning to more secular material, Simon showed a series of clips from the Terminator films, each of which included the phrase ‘come with me if you wanna live’. There are lots of subtle references to the Saviour, and although the Terminator is a ‘cyborg’, he has some Christ-like attributes, such as his willingness to be destroyed for the sake of humanity. der who became a saviour. However, Superman Returns includes several references to the first chapter of St. John’s Gospel, and there are visual allusions to Salvador Dali’s St John of the Cross and to the Pietà. The Fast and the Furious franchise is one of the most popular film series of all time; F&F6 ends with a prayer! Many films use time travel as an essential ingredient to their plot. Time travel can help us think more deeply about our destiny and our place in God’s plan, and science fiction can act as a lens to focus on what it means to be human; it makes us think about ‘how we are how we are’. Simon ended his talk with some practical recommendations: if we want to use film clips ourselves, the best to use are the ones that have had an effect on us. The Bible Society has produced study material called Reel Images (still available on-line), and Damaris Media does something similar for contemporary films. ent about Christian values in Dr. Who, Simon replied that Dr. Who plays with the idea of ‘hardware’ (the body) and ‘software’ (its mental and spiritual dimensions). Where does the film Resurrection fit within genres? Simon felt that it had rather a clunky plot and became ‘preachy’ in its second half. Does Simon enjoy graphic novels? Simon replied that he’d never read one! But they’ve become a rich source of material for films that he has enjoyed. Some of the Narnia films have departed from C. S. Lewis’ novels; although the books are enormously popular, the films have become progressively less so, though they remain some of the most popular Christian films; the filming of the remaining books in the series looks uncertain. Wm Paul Young’s novel The Shack was made into a film that was very popular in America, but didn’t do well in the UK. The book has a more ‘positive’ ending than the film, where the hero is unable to find his daughter’s killer – why was this not resolved in the film? Simon: that situation reflects much of real life – ‘bad things happen to good people’. Films sometimes change aspects of well-loved books: James Hilton’s novel Random Harvest tells the story from the hero’s point of view, whilst the film tells it from the heroine’s. What are the difficulties in using film clips in talks? There must be so many dangers of using the wrong clip, or the audience catching hold of the wrong points. Simon: Know the film! And be very careful which bits you use! In addition to the film clip compilations mentioned in Simon’s talk, a Christian website called WingClips provides film clips arranged by theme, which makes it very useful for group-work.